Welcome Hall Mission opened its doors in 1892 to Montrealers looking for care, guidance, and support. Today, they provide a wealth of services ranging from food banks and housing to dental care and employment training. They achieved these amazing feats only through the loyal support of their partners and donors. As Welcome Hall Mission seeks to meet the needs of a growing community, the consistent call for growth inspires us here at Frontier, as their direct mail fundraising team. We are always looking to push the limits of what we can achieve for our clients. What makes Frontier so uniquely effective is our crew of experts that specialize in multiple areas of fundraising. Charitable organizations generally record their donor base in some way, but not every charity can analyze what makes those donors give. That’s why we have an in-house data specialist who is passionate about crunching numbers and making improvements wherever possible. Thousands of donors give generously to Welcome Hall Mission every year, but why do they give the amounts they do, and would they be giving more if we asked for more? When we set ask amounts, how do we know if we’ll “over ask” and scare off potential donors or “under ask” and miss an opportunity? It’s questions like these that lead us to hypothesize about new potential ask strategies. Previously, we sorted donors into segments using the recency, frequency, monetary-value algorithm (RFM). Once segments were determined, another algorithm set the ask amounts for each grouping. Our data specialist then manually adjusted those results to take into account the psychological factors that the algorithm may have overlooked. Tweaking ask amounts often causes a seesaw effect between response rate and average donation. Asking for too much can mean fewer donations overall, but asking for too little can mean smaller gifts. Segmentation helps determine the appropriate ask for groupings of people but creates a one-size-fits-all approach per group. With groupings of donors, it’s unavoidable that some recipients receive ask amounts outside of their comfort zone. There is always an open ask included, where donors can fill out an amount themselves; however, research has shown that ask amounts can either influence gift size or discourage gift giving altogether. This means that ask amounts wield the power of suggestion, which can be very useful to an NPO’s bottom line. So, is there a way to avoid playing the odds and tailor our asks to each individual donor? Enter, the test. We concentrated on 3,000 donors from Welcome Hall Mission’s 2018 Easter appeal as a sample size. The control group, along with each of the 2 test groups contained volumes of 1,000 people. 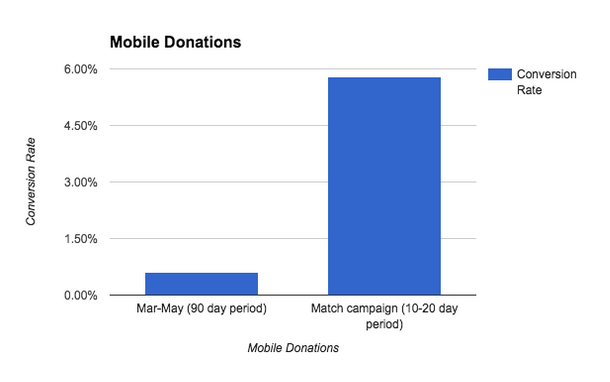 The 1st test group retained the segmentation but based the ask amounts on the median contribution for each donor segment. The 2nd test group removed segments entirely and provided each recipient with a set of personalized ask (or Bespoke Ask) ask amounts based on their most recent contribution. When the results came in, we noticed a few things. Firstly, our test proved previous theories to be true: the group of median-based donors performed better on the response rate, but worse on the average gift than our control group. Secondly, we found that most grassroots donors gave more when their ask amounts were personalized to their specific donation history. One detail stood out among the rest. 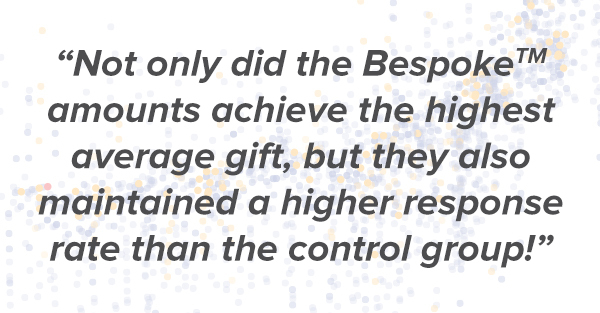 Not only did the Bespoke Ask amounts achieve the highest average gift, but they also maintained a higher response rate than the control group! Our data specialist attributes a large part of this breakthrough to the psychology of suggestion, which cannot be utilized as effectively when working with fixed ask amounts or generalized segmentation across a broad donor base. What do all these numbers mean for Welcome Hall Mission? This new strategy of customizing amounts to individual donors produced an increase of approximately 15% in revenue for the Mission! And as you know, a few dollars more from thousands of potential donors adds up to make a significant impact on the Montrealers being served. A hypothesis is only as good as its method. To confirm that it’s worth the time and effort to personalize each donor’s ask amounts, we need to continue our research. We’ve adjusted our approach based on other factors in each donor’s specific giving history, focusing on the most recent contribution, median contribution and minimum contribution. By tweaking the data and retesting, we are hoping to repeat and improve our results compared to last year. Welcome Hall Mission’s 2019 Easter appeals are in the mail, testing further personalized Bespoke Asks. We are also sending out a Mother’s Day appeal with Kelowna’s Gospel Mission to test the same Bespoke Asks. We look forward to seeing how donors respond and can’t wait to report back to you with our plans for refining the strategy and implementing this method for more NPOs. Stay tuned! History Started by Reverend Al Tysick in the late summer of 2011, the Victoria Dandelion Society registered as a charity October 2012. Victoria Dandelion Society (VDS) is very much a grassroots charity, founded and run by a single man who has made it his mission of over 30 years to care for Victoria’s homeless community; better known as Rev. Al’s street family. Frontier was brought in early on to help grow the donor base, at the time consisting of mostly Rev. Al’s friends and close contacts in the community. As VDS was a fairly new charity, it gave us the opportunity to implement best practices from the get-go rather than working backwards to implement fixes to processes already underway. 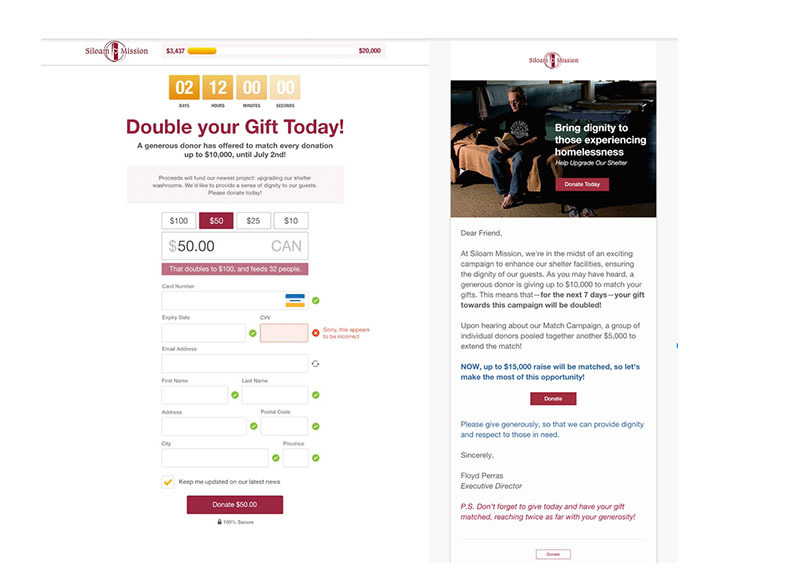 The new and improved website, renamed from dandelionsociety.ca to hopeliveshere.ca, provided a strong foundation to foster online giving with clear messaging in Al’s unique voice and a visual outline of the work VDS does in the community. Donors, current and potential, are able to see where and how their dollars are put to work and observe their impact on the ground. 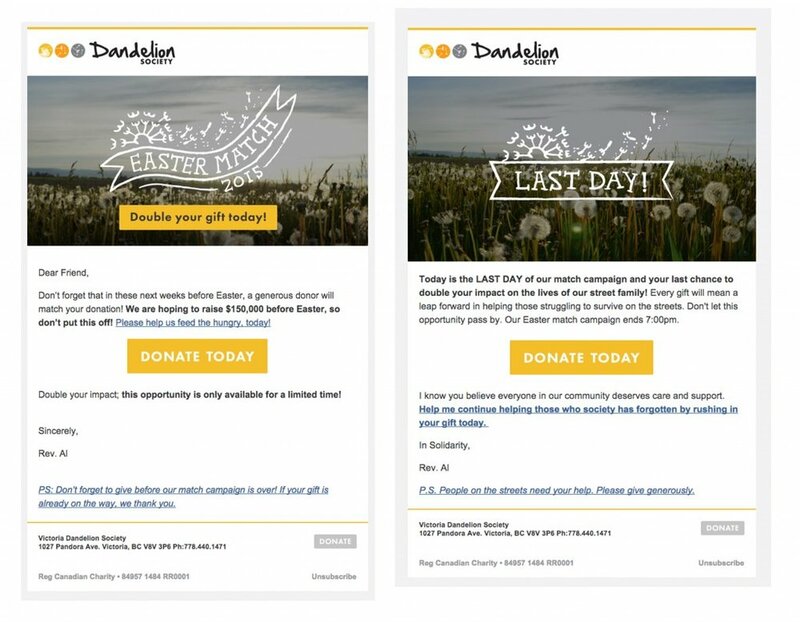 The email program keeps donors informed and engaged with Dandelion Reports, online appeals, stories, and messages from the desk of Rev. Al. The purpose of sharing this information in such a personal voice is to demonstrate the tangible impact donors are making by supporting the Victoria Dandelion Society. Donors are known to give up to three times more to charities that show the problem being solved and where their dollars will go. We also set VDS up with the database SalesForce.com (which we recommend to nearly all our clients) to ease the tracking process of online giving. Additionally, Stripe paired with our own customized donation system made gift processing a breeze for donors and helped us avoid the dreaded donation form abandonment. Every monthly donor appeal letter is handwritten and personally stamped! As a fundraising tool, this works incredibly well as this level of personalization shows donors that you notice and value them which makes them feel connected to your organization, which means they’re more motivated to support it. It certainly worked for VDS as we grew from two monthly donors to 125 monthly donors in under three years. Our cultivation and acquisition efforts were rewarded when donor numbers grew from 141 in 2011 to 2,582 in 2014. In 2014, VDS welcomed 1177 new donors compared to 2011 when they had all of 90 new donors. The results truly speak for themselves with a revenue jump of $22,389 to $244,576 in three years. It’s humbling to see a small organization that directly impacts the local community experience such rapid growth in the few years we’ve been privileged to work with them. From starting out with under 150 donors to over 2,500 is no small feat for a grassroots organization like Victoria Dandelion Society. They also saw website revenue jump from $28,672.80 to $40,418.10 (up 40.96%!) in two years. Not only did their revenue increase but their number of gifts went up by 42.64% (258 in the 2013-2014 period vs 368 in the 2014-2015, to mid April). It’s wonderful to see that a clear and simple online giving strategy combined with a strong print program has really worked beautifully for VDS.